I was inspired to make this amazing Meal Prep Trio…Sweet Spicy and Tangy, by none other than PinchofYum.com…A website that has my full attention in the blogging world. The talented husband and wife duo (Lindsay and Bjork) have been such an inspiration, but also full of such powerful knowledge about blogging. Even better they share all their acquired knowledge with their audience, a combinations of talent and thoughtfulness that has taken them straight to the top of the blogging platform. So, as I was left inspired by this meal prep I decided to put a few taste specific twists on it. I’m sharing with you a simple recipe that my family loved. 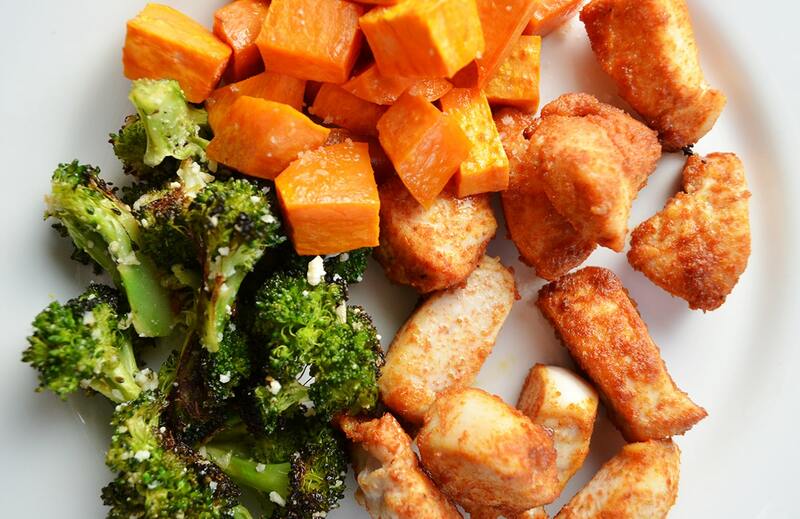 This Meal Prep Trio…Sweet Spicy and Tangy is healthy, delicious and packed with flavor to make your taste buds explode. I decided that after tasting the spicy chicken, moving onto the naturally sweet tasting sweet potato that the ultimate pairing of flavor would be my recipe for The Best Roasted Broccoli. This broccoli recipe is filled with tons of tangy lemon juice and parmesan cheese, I mean seriously… it’s heavenly! Broccoli is definitely a SUPER FOOD! Broccoli boosts the immune system, helps to prevent cancer, supports the nervous system and much more. I just read this awesome article on Well-BeingSecrets.com with 43 Science Backed Health Benefits of Broccoli. Now, my absolute favorite spicy mix that I use in a multitude of recipes is Mama Mia Beer Taco Mix. You can click on this picture below for a link to their website and to purchase. Just the right combination of heat, spice and flavor all in one packet. Where to start… will you begin with that spicy piece of chicken, or are you jumping straight for the sweet side, maybe after you’ll cleanse it all with a bit a lemony tang. Just start making this meal and enjoying it over and over again for a perfect trio of flavor.